One of the biggest implications of our UU first principle, the inherent worth and dignity of every person, is how we treat people who we feel threatened by. 43 “You have heard that it was said, ‘Love your neighbor[a] and hate your enemy.’ 44 But I tell you, love your enemies and pray for those who persecute you, 45 that you may be children of your Father in heaven. He causes his sun to rise on the evil and the good, and sends rain on the righteous and the unrighteous. 46 If you love those who love you, what reward will you get? Are not even the tax collectors doing that? 47 And if you greet only your own people, what are you doing more than others? Do not even pagans do that? 48 Be perfect, therefore, as your heavenly Father is perfect. This is a very hard teaching. Our human brains are not wired this way. Our amygdala's spark the fight or flight response when we perceive a threat. To override our amygdalas and engage our pre-frontal cortex takes intention, self discipline and effort. In A Course In Miracles the following advice is given: "When you feel the holiness of your relationship is threatened by anything, stop instantly and offer the Holy Spirit you willingness, in spite of fear, to let Him exchange this instant for the holy one that you would rather have. He will not fail in this." T-18.V.6:1-2 This prayerful, mindful approach can be miraculous in lowering one's anxiety and allowing us to lean into the relationship rather than attack. 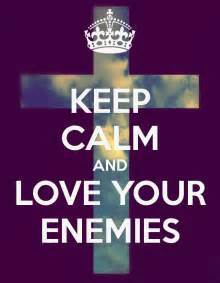 Loving our enemies requires us to look for the divine spark in people we fear and focus on that. This willingness is a sign of spiritual maturity. When we see all our brothers and sisters as parts of our shared humanity deserving of respect, compassion, and love, we experience a great and abiding peace. Our hate for the other is so primitive and basic that it occurs even in the internecine warfare in our own churches.